Peter J. Holt, CEO and general manager, and Corinna Holt Richter, president, both of HOLT CAT, stand in front of a 1932 Caterpillar Gas 65. Today, HOLT CAT is the largest Caterpillar dealer in the United States and a company doesn't get that way without a generation-spanning, forward-looking approach to business. With a backdrop of vintage iron and employees, retired employees and their families celebrating 85 years in business, Peter J. Holt and his sister, Corinna Holt Richter, spoke with Construction Equipment Guide (CEG) about the HOLT CAT family. Holt and Holt Richter assumed leadership of HOLT CAT on January 2018 and both were well positioned to take the helm of the company. Corinna Holt Richter is president and chief administrative officer of HOLT CAT. She has a formidable list of responsibilities. Holt Richter leads the administrative and support divisions at HOLT, including human resources, safety and environmental, information technology, organizational development, facilities management, continuous improvement, legal, marketing and strategy. She is the great-great granddaughter of Benjamin Holt, who introduced the first practical track type tractor in 1904, which he named the Caterpillar. She represents the fifth generation of the Holt family business and is now leading the Holt legacy of service and innovation into the 21st century. She joined HOLT CAT in 2011 as a trainee in HOLT's Leadership Training Program. In 2012, after completing a comprehensive rotation through every department in the company, she was promoted to the role of general parts manager for the machine division. From there, she assumed the role of vice president of product support sales. In 2016, she was named executive vice president and chief administrative officer before taking on her current role. She earned a Bachelor of Arts degree in Art History from Vanderbilt University in Nashville, Tenn.
Holt Richter is an active leader in the San Antonio community, serving on the San Antonio Art Museum Board of Directors and the Christus Santa Rosa Children's Hospital Foundation Board, along with the Boards for Girls Inc. and the Brackenridge Park Conservancy. She also is involved in United Way of San Antonio and Bexar County. Peter J. Holt joined HOLT CAT in September 2011 as a trainee in Holt's Leadership Training Program and subsequently completed a similar program for Caterpillar Inc. in Peoria, Ill. In 2012, after completing a comprehensive rotation through every department in the company, he was promoted to general service manager of Holt's machine division, the largest division of HOLT CAT. He led all service operations for heavy equipment, including technical services, lube service and Caterpillar support. In March 2014, as vice president for commercial engine sales, he was responsible for diesel and natural gas engines sales to the electrical power generation, petroleum, industrial and other commercial markets. In January 2015, he took on the role of senior vice president of diversified businesses where he was responsible for leading HOLT CAT's new Rental Services Company, Texas First Rentals; HOLT Agribusiness, and HOLT Crane and Equipment. In March 2016, he was promoted to executive vice president and general manager where he was responsible for all enterprise operations of HOLT CAT before taking on his current role. He graduated from the University of the Incarnate Word in San Antonio with a Bachelor's degree in Business Administration. Holt currently serves as chairman on the SA Works Board. He also serves on the board of directors for the San Antonio Chamber of Commerce, the Board of the Alamo Academies of the Alamo Community College District and Workforce Solutions Alamo. He serves on the advisory board for the University of the Incarnate Word. He is on the executive committee of the United Way of San Antonio and Bexar County and is actively involved in United Way fundraising activities. Holt is committed to wildlife conservation efforts through his role on the executive committee of the Texas Wildlife Association. The Holt family business is well led and also appears to be poised for the future with young, up and coming leadership waiting in the wings. "We have five [children] under five!" said Corinna Holt Richter. "So that's our retirement plan, right there." Peter and Corinna's father Peter M. Holt still has close associations with the industry in which he was a longtime leader. "He is, I think, enjoying himself," said Corinna Holt Richter. "My dad is not the type to retire and not do anything. He always has various ventures and businesses he is investing in. Growing his antique fleet is certainly one of them. He definitely is enjoying life at the ranch in Blanco." 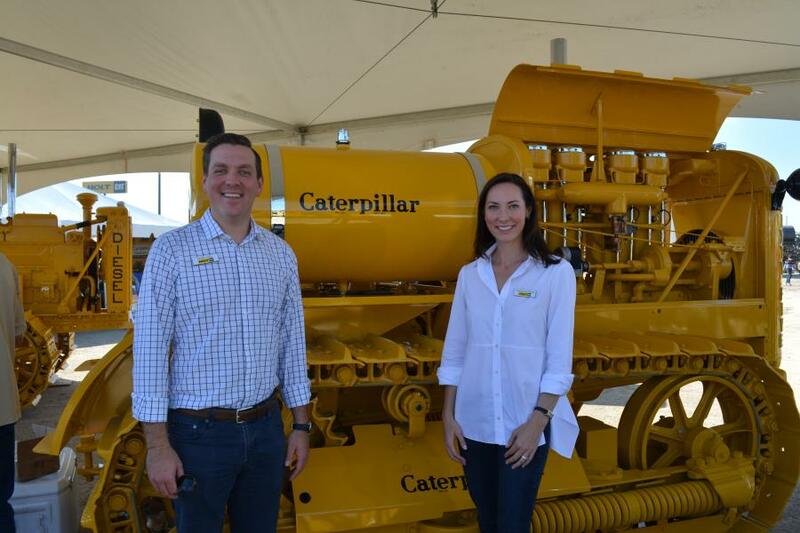 Read more about what Peter and Corinna had to say to CEG about HOLT CAT's vision for the future during the 2018 Antique Caterpillar Machine Owners Club National Show.